There are basically two kinds of city centres: historic and modern. Historic city centres, built in an era when no cars existed, tend to be very walkable environments. Modern cities, however, are much more car-dominated, leading to a less attractive walking environment. Rotterdam is one of the four main cities in the Netherlands and its historic city centre was destroyed during the Second World War. The post-war reconstruction mainly caters to cars, like many other cities throughout the world, resulting in a somewhat pedestrian-unfriendly walking environment. We set out to analyse this environment and its users, and hopefully with our results, make recommendations for car-dominated cities worldwide. We wanted to find out which paths people really took and to gain insight about personal preferences in a modern, car-dominated city. We wanted to extract lessons for improving the city centre based on both real experiences and objectively measured behaviour. Our results illustrated the routes users frequently walked and the destinations they visited. Participants not only produced hundreds of trajectories representing their walking behaviour, but also actively participated in building a rich experience map; a map based on their user experience at eye-level. By adding up this information, it was clear which streets were frequently used yet showed poor quality, or the other way around: high quality public space but hardly used. Based on the results, the Municipality of Rotterdam could strategically focus which places needed investment to stimulate warm streets, good plinths and a great city at eye level. The field research lasted four days in the beginning of May 2012. 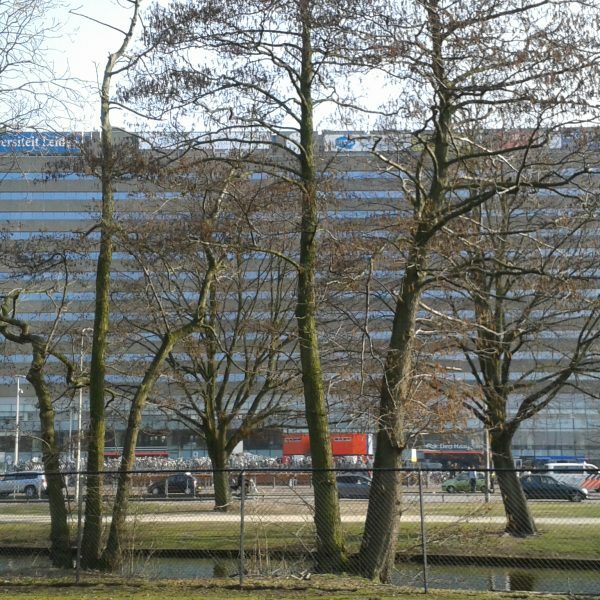 Researchers were located in four parking garages in the city centre of Rotterdam: Westblaak (BK), Lijnbaan (LB), V&D (VD) and Schouwburgplein (SP). Visitors who arrived by car and continued their journey on foot were asked to volunteer in the field research. The participants carried a GPS-device with them for a couple of hours (max one day). The device registered their whereabouts every 5 seconds. A total of 674 visitors participated in the research, leading to 585 valid trajectories. Additionally, the participants were interviewed and delivered feedback on their experiences. To understand walking behaviour, we made a distinction between ‘moving’ and ‘staying’. Moving represented active movement, while staying represented lingering at a ‘destination’ or performing an activity (shopping, eating, etc). Participants tended to park their car at a garage as close as possible to their destination and often walked as direct as possible. 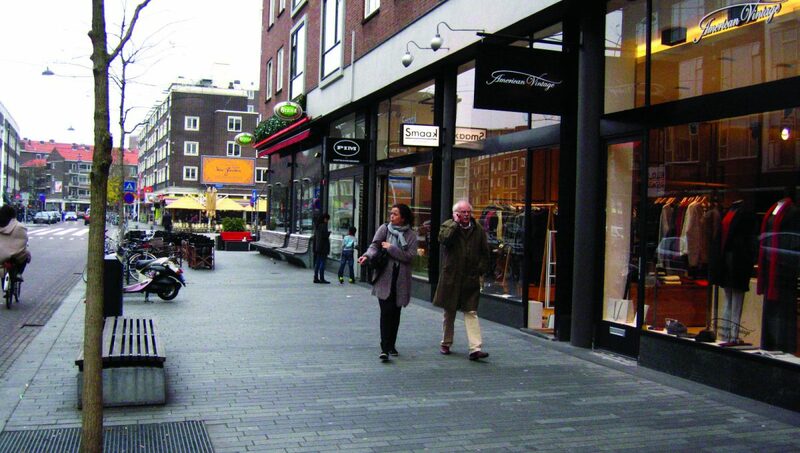 The highest concentration of movement was located on the main pedestrianised shopping street (Lijnbaan) and barriers in the network were two large, 4-lane boulevards (Coolsingel and Westblaak). Staying was mostly concentrated near the department stores. We also assessed the quality of public space as experienced by the participants. After spending the day in the city centre, the participants were asked to map their experience. Which places did they enjoy and why? Which streets felt uncomfortable and why? 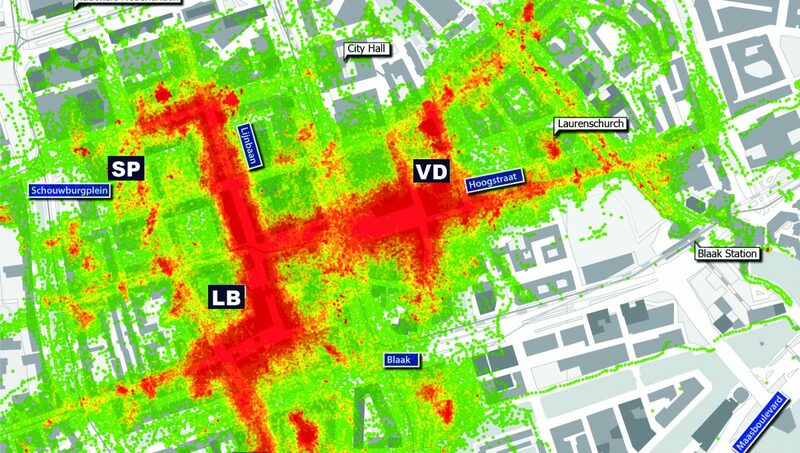 This data offered qualitative information about the street experience of visitors. The visitors marked several spots as nice places, usually characterized by activities on the streets, cafés, seeing the skyline, good atmosphere, retail range, diversity of small specialty shops and cleanliness of the areas. Unfortunately, the city centre is not entirely a positive experience. The visitors marked several spots as unattractive streets or negative places, generally characterized by a lot of motorised traffic, a lack of greenery, empty and boring areas, no public toilets, dangerous crossings (traffic), unsafe due to no eyes on the streets (social), little commercial diversity and lacking hospitality. While the city centre of Rotterdam offers many well-used, attractive public spaces, other areas are under-used or impart negative experiences. Upgrading public space quality by adding new green areas or implementing car-free streets to reduce motorized traffic and increase safety are two “quick” fixes. Moreover, adding new functions like speciality shops, playgrounds and co-working spaces could diversify the commercial activities in the area. Finally, repairing missing or broken links, creating better circuits and improving accessibility to under-used places could also enhance the public realm. The routes people chose were based on their existing knowledge of the city and the desire to create new knowledge of the city which requires surprising its users, tempting them to stop and take a look on impulse. This is exactly what’s lacking in Rotterdam’s city centre. The main shopping area is too predictable and uniform. Improvements in public space should not only focus on the street or profile of a building, but especially the space between buildings. That’s where city life exists and continues. 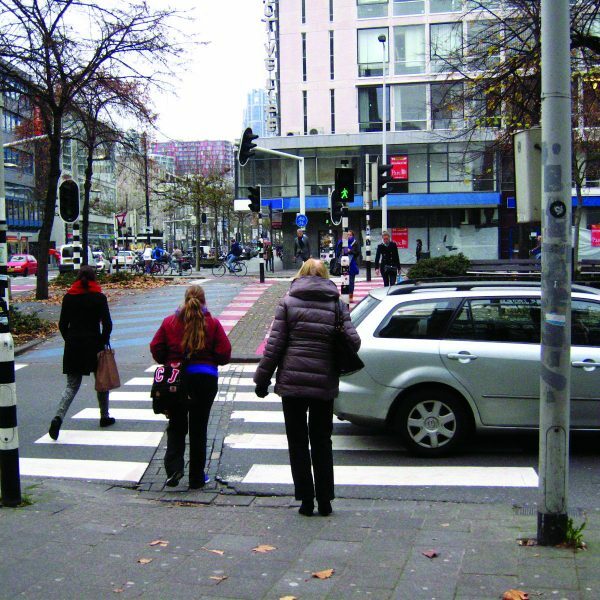 This research was carried out in spring 2012 within the elective course ‘Urbanism on Track’ (AR0068) at Delft University of Technology, commissioned by the Municipality of Rotterdam, Department of City Development, and coordinated and supervised by Stefan van der Spek.